I saw this over at C.R.A.F.T. and decided I wanted to use it. I haven't been in a posting with words mood lately if you haven't noticed. I'm trying to decide what and where I want this blog to go. I really only do if for myself and I'm not sure what to write about lately because I have so much going on in my life, it's gets chaotic and I'm trying not to let life be that way. C. chore you hate: dishes, after doing them for 5 or 6 people consistently, I hate them now. D. dogs: None, i wish. We have to find one my oldest is not allergic to maybe next year, I'm not sure I'm ready for that yet. E. essential start to your day: quiet time after the boys are in bed. F. favorite color: it used to be green but I'm liking variety lately and orange. 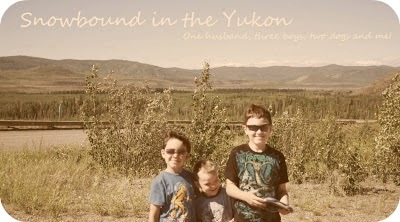 L. live: Northern Canada, Yukon! M. maiden name: Still used sometimes. Most people know me by the last name even though I've been married 10 years. N. nicknames: Donny by my step daughter, babe my my H. None other than that. O. overnight hospital stays: All the births I was in the hospital for at least 4 nights each. Q. quote: i have a ton of favorite quotes..
S. siblings: a brother, who is 5 years younger than me. T. time you wake up: anywhere between 5am and 7am depending on how late I stayed up reading. V. vegetables you dislike: olives, anything bitter but I'm getting better at trying new ones. Y. yummy food: creamy pasta with chicken. I don't like olives either! Bleck!